For those who do not follow NST’s daily SOTD threads, some time ago chocolatemarzipan8 announced she would not be pursuing new perfumes and would enjoy what she had in her collection already. Every time having finished something she would officially announce “Thunked it!” Over time many other participants joined her, and now almost every day somebody announces “THUNK.” Of course, most people do it with samples but sometimes they report decants or even bottles. It prompted me to look into my usage pattern. Bottles are the hardest for me: once I decide that I want to have perfume in my collection, I never want to not have it. As a result, those perfumes that I like less stay in my collection because I do not use them often but do not want to part with; and with those that I do like I’m content… while I have more than one-fourth of a bottle. And as I approach that imaginary demarcation, I start feeling anxious and tend to use those perfumes less often or in an even more than usual office-friendly manner (1-2 tiny spritzes). But, in general, I’m fine with my attitude towards bottles: I keep using perfumes that I love on daily basis, even if I do not finish bottles. Alternatively, I end up buying a back-up bottle – and then feel better about finishing the previous one. With decants I have a mixed case: I do finish some of them, though usually only those that graduate to a full bottle (at least in my plans). But decants that I plan to use and be done with rarely move below one-fourth volume left in a vial, whatever the size is. The reason, I think, is that I like having an option of wearing those perfumes more than actually wearing them. So I’m reluctant to finish those decants for the fear of losing that comfort of knowing that I have them. Used up 5-7 ml decant usually means I want a bottle. So, again, it looks like I wear perfumes that I like the most while “hoarding” those that I shouldn’t wear anyway since I don’t like them that much. I’ve just emptied two samples I had forever: L’Artisan Parfumeur Mimosa pour moi and Arabian Oud Kalemat. Guess what. I’m upset that those are gone and already started questioning that “don’t need them” decision. So it seems safer not to “thunk” those perfumes that I liked but didn’t love enough to put on the mental “to buy” list. Do you finish any of your perfumes? This entry was posted in Favorite Perfumes, Random Stuff. Bookmark the permalink. I have a lot of samples I’ve collected over the years, and it seems ridiculous to not just use them in one go since they’re so small. But on occasion I find it is helpful to have them, when I want to go back and reference a scent. Sometimes I even find my opinion may have changed if enough time has passed; one that I didn’t care for I now like. I am still buying, but I’ve definitely slowed waaay down. There was an era when I tried every new sample pack that Luckyscent came out with. After too many disappointments I’m a lot more picky. I used to buy/swap many more samples in the past too, and I’ve accumulated hundreds of “reference” samples. I plan to still keep some of them but by now I know myself well enough to recognize those perfumes, about which I would hardly change my mind. So, unless those are something pivotal, I don’t think I should keep those. Also, I should probably pay more attention to my database classification for those samples that I have because I keep retesting those that I thought I shouldn’t test any more – not because I want to but because I forget my previous decision. The database is a good idea, and something I would assume you’d be good at, judging by some of the other record keeping of scent wear, etc, you have shared here. For me, that’s a challenge. Every year I have a word, or a goal, that I am trying to aspire to. This year it was organization, but I’ve got a long way to go! Honestly, lots of the bottles I have been thunking I have no “story” or emotional attachment to. They were mostly partially used bottles given to me by a generous APJer because she has a large collection and they weren’t getting much love in her house. So I liked them and I wore them, until they were done! I really enjoy spending a vast amount of time with one fragrance and getting to know it and all its nuances. I guess as I have gotten older I need less variety. Sometimes having too much can make my head spin! I have a very select few full bottles that I will NEVER drain…and, in fact, I was looking at one of them in my basement this morning and seriously considering a back up bottle because they sell for very inexpensive on ebay (30 dollars for 100 ml). I also have a select few samples I won’t drain… at least not yet……SSS and St Clair Scents and a few of my old loves from a long time ago. I won’t use them but keep them just to sniff. I loved your story about your first date with your husband perfume (something from Gap, right? It was before my time in this country). And I think that you should buy that bottle despite the “no buy”: this is not a perfume, it’s a sentimental trinket that just happened to be in the form of perfume. Between you and hajusuuri, you’ve influenced a lot of people on NST – hajusuuri-style application and “large samples” and your “thunking” and wearing the same perfume multiple days in a row – definitely caught on. Guess what? I pulled the trigger!!!! Bought my bottle of GAP Heaven. Enabler pin for you !!!! Found it online for $25.89 for 100 ml and free shipping….that is “hajusuuri math free”…..I can start wearing it again without worrying! It should come in some time this week or next. I rarely use up a dabber sample since it is hard to get a full wearing out of them – I normally spritz 7-8 times anything I am wearing, so they are normally only used to test and see if I want a full bottle. Spray samples I do use up. Decants I almost never buy, as they seem to evaporate before I use them up. I do have a few that are for scents I rarely want to wear, but normally I go straight from sample to FB. I almost never finish a FB, most of my bottles stay pretty full as my collection is huge. I did lose the last 10% of a loved bottle once because it seems the more air in it, the faster it goes off, so I learned hoarding doesn’t pay. When something gets low I try to finish it quickly. I use parafilm on all of my decants and even samples, so I slow down evaporation significantly. In my case – I usually have to finish sample before I decide what to do next with the perfume, to commit to a bottle or to forget about it. But sometimes, even if I liked a perfume I offer what I have left to be sent to you or to Jillie, especially if you can’t access a fragrance locally. So far I have only finished a bottle of Prada Amber Pour Homme, for which I immediately purchased a backup. Same for AC Silver Iris. I shared some with a friend for her birthday and that emptied my bottle but I already had a 2nd one waiting, still in sealed box to be opened. 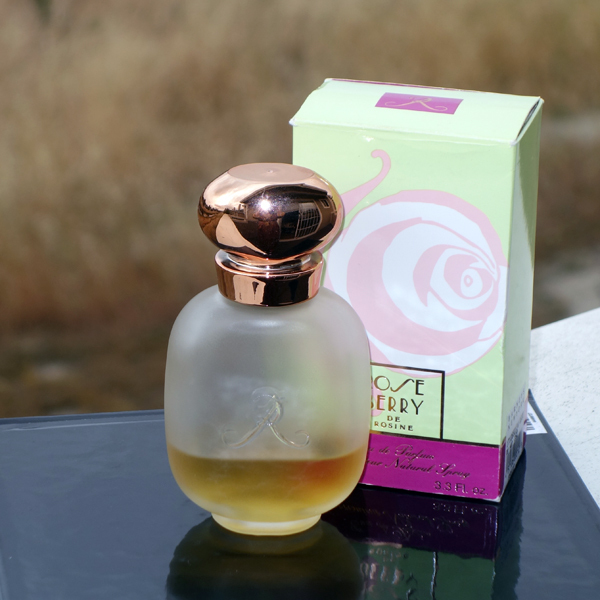 To me decants are a way to discover perfumes that I cannot try locally and I usually participate in splits at Parfumo (German perfume forum/database). Depending if I like the perfume I would empty a decant to then buy a bottle (happened with Infusion de Mandarine) or I would just use it up and then forget about it. Or swapping a partial bottle would also do the trick, although I’ve never done it before. Over time in my head samples stopped being associated with something I can wear, so once I decided I wouldn’t be buying that perfume (at least a decant size), I don’t even think about using a sample up. So I can pass it on if one of my friends wants to try it. I thought I didn’t need Mandarine but with each next test I get closer and closer to looking for a bottle ;) I would have bought it already if it had been available in 30 ml. I have to ask! Periodically I see in your comments several “The” articles that start with a capital letter even though those are in the middle of the sentence. Is it some strange autocorrect behavior, or is there some other explanation? I read the start of that on NST, or I wouldn’t have known exactly what it meant! After all we are not native speakers of English, so there will be some words lacking in our vocabulary. I have been thunking some samples lately, but none of my bottles are anywhere near being used up. At the beginning of the summer I culled my very large sample collection and set aside a large quantity to pass on- duplicates, scents I hated, bottles I bought, and many of the mainstream Sephora and Nordstrom samples that had piled up. With what is left I have some “reference” samples that I will keep, and some that I want to explore further for my own education. Some of these have ended up being thunked as I used generously in order to get a full wearing. I’m on a firm no-buy for a while so hopefully I will start to make progress on some bottles, but I can’t see using anything up for years. Doesn’t it feel like you’re neglecting/potentially wasting perfumes that you really like (your bottles) while using samples of perfumes that you do not like enough to want them in your collection? Or do those go on the future “to buy” list? I wanted to give the latest set of samples a good wearing to see if they were bottle worthy in the future. Most samples get one sniff and then out; or set aside to give a solid testing in the future, if they fit into a “hole” in my collection. Once school starts I will be back to wearing my “safe” scents – sampling is too risky for my job (music teacher). As ever I appreciate your systematic analysis of these different thunking scenarios. I am quite similar to you on the bottles and decants, but have lately taken great pleasure in thunking samples. Indeed I was going to mention this surprising turn of events in an upcoming post I may write on my holiday. It seems noteworthy as I have historically been a sample hoarder on ‘reference’ grounds, but finishing samples – even of things that I like a lot – now feels like an easy thunking win. And I have so much else to love. I have finished bottles in the past (and now don’t I wish I had held on to some of the original Diorissimo I once had!) but now, even if I’ve used 99% of a bottle, I keep it to remind myself and refer back to it. I still have my original bottles of Shiseido Zen 2000 and Anne Klein II, with drops left in each, just so I can occasionally sniff them. Don’t know what I’ll do when I have to make serious storage decisions! Do you know already that you’ll have to make those “storage decisions”? Or is it an abstract thought? In general, you should try to keep as many of the bottles that you like as possible: I bet for no money you’d be able to replace at least half of them even today – and who knows which ingredients will be banned tomorrow. While I usually wear from my full bottles or even partial ones that I’ve acquired from splitters, I have a largish collection that thunking a bottle is very rare indeed. I also wear from decants and cycle through them such that running out doesn’t happen often, if at all. As to samples, I usually end up either buying a FB after trying them or losing interest that they end up as freebies. I’ve never really considered keeping samples “for reference” because they would probably evaporate and be useless to utilize as such. You already know that I consider giving away or bottles confiscated by family members as THUNKS . Which means you do loads of thinking!! THUNKING….. not thinking!!! Although you do loads of that too! Spell check is not my friend. 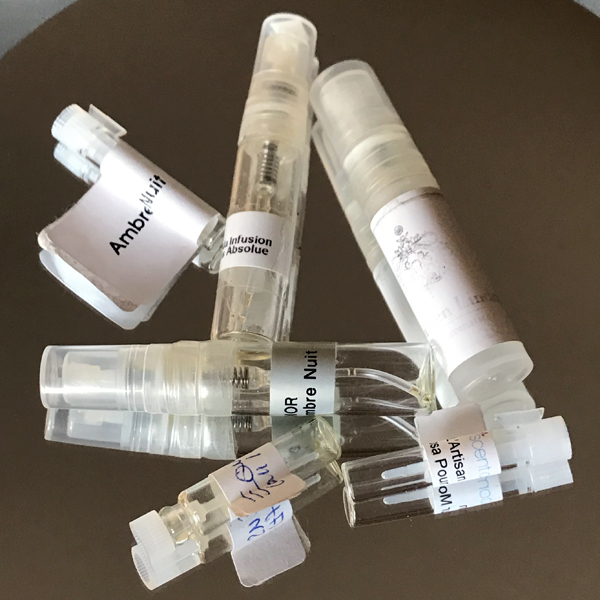 A lot of my “referencing” comes from my obsession with finding smell-alike perfumes: while I’m not good with recognizing notes in perfumes, I often smell resemblances between a new perfume I’m trying and… – here’s where my “library” comes handy because I can compare the similarity in my mind to actual perfumes. For a long while I wanted to keep all the samples I got – even though I didn’t use them for anything after finishing the initial sampling. But now, after I’ve discovered that some of them went off (I rarely loose them to evaporation since I use parafilm), I started thinking that they might have fulfilled their destiny better had I passed them on years ago… But I still plan to keep some of the samples – for different reasons, just not all of them. I started thunking samples and decants after Chocolatemarzipan8 announced that she was not going to keep hoarding most of her perfumes anymore and just enjoy what she already had. I decided it was time for me also to start reducing the huge size of my collection, which I feel is getting wasted, since I do not have enough time to give enough love to all my perfumes. Thunking many of my perfumes and in the process enjoying them and saving money has been very relieving! I started with samples and decants. I usually do not buy samples, because I have a scent eating skin and a small vial, either dabbed or sprayed is not enough for me sometimes to appreciate and enjoy the scent in full. I only get decants when a full bottle is very expensive and I am not willing to pay the price. 99% of my collection consists of full bottles. This year I decided to spray lavishly on perfumes that I know are not going to disturb anyone around me, especially at work. That is also a way to thunk a little bit everyday from those full bottles that never seem to go down, no matter how much I spray. Lately, most of the new releases have not been worth enough to reach the full bottle status and whatever I have is beautiful enough and even better than recent perfumes, at least for me. Most of my perfumes and decants have come from very generous NSTers and thanks to them, I have been able to decide what samples will make it to the full bottle shopping list, without making a blind purchase that I can regret. Decants of beautiful perfumes I treasure and I just spritz a small amount. Fortunately, at this point I do not have samples or decants left for the summer season and I am enjoying my full bottles now since last week. I will keep thunking in fall, winter and spring. Back up bottles are very few. No more than 4. As soon as I see a bottle of what I love being less than 50% anxiety grows. Time to decide then if a back up bottle is needed (looking at you L’Attesa! ) to join my collection again. ready to welcome a new addition in the future. Love this…. especially the lavish spraying of your beloved full bottles!!! I will try to spray more on weekends since for my office environment sometimes even 3 sprays are too much. L’Attesa is so beautiful! I have a bottle but I keep it in the original wrap while finishing the last drop of my large sample (this is one more scenario that I haven’t mentioned: I buy a bottle – and then finish the sample/decant I had :) ). Hmmmm, I never gave that much thought to my perfume finishing habits but reading your post I realize I have pretty much the same style. The only difference is that I still have bottles of some perfumes I grew out of where there is a little left but I don’t want to use it up because I loved them and you never know when things might turn around. That said, I am now in the phase where I only use what I have and I have no wish to buy new stuff. I actually don’t have much of a wish to even try new stuff unless someone I trust makes it sound incredible (like Asali with Niral). I also have older bottles that I don’t plan to finish but keep for sentimental reasons (they even have a separate designation in my database – “old flame”). I’m still curious about new perfumes but I don’t want to test them all (not that it would be possible anyway with the number of new releases every year). Great post. I actually find it quite easy to let go of the perfume bottles I wear less often. I give them away – mostly to my mum and sister. I never actually finish them myself. I find it harder to let go of samples. As I’m considering moving this has become a pressing issue. I thought of just chucking out whole boxes of them without checking what they are individually first but I can’t bring myself to do it yet. I’ve spent ages looking at each one but found another stash. It’s mad because I never consult them. With samples it gets ridiculous for me as well: I can remember that I didn’t like that perfume; I might have a record in my database diary that says that I shouldn’t test it any more – and still, before partying with it I feel compelled to at least sniff it again and sometimes even test – and it’s instead of finishing testing some other perfumes that I liked! If you do move, please pack carefully all of your perfumes. I try to buy fewer samples than before and am really trying to finish samples, and it works! But it seems I’m better at using up body products and lipsticks! With bottles it is more difficult, even the ones which I fear may turn or where the top notes show signs of fading. It seems I’m no longer able to wear the same scent for several weeks in a row, so finishing a particular bottle doesn’t happen often. I seem to have lost the ability or desire to wear the same perfume two days in a row – let alone weeks. But I decided to attempt to finish at least some of the decants that I do not plan on replenishing by wearing them maybe twice more often then I would have otherwise. You have a good plan, Undina! I think these days I seldom wear anythink 3 days in a row, except when a bottle is new, plus sometimes the EBP in my office drawer. I am totally loving the THUNK craze. It’s such a perfect description of the joy that emptying anything affords. I rarely finish things around here especially samples. Most of them get moved along rather than finished. Decants get used but rarely used up. One thing that I go through regularly are the 13ml Niki de Saint Phalle bottles because I travel with them often. Also Miss Dior vintage spray perfumes get emptied quite a bit too. Nah, using up anything for which you have back-ups doesn’t count! But you reminded me that I should wear Miss Dior more often since I have some stash of it. BTW, great to see you here. OH! Bugger! I thought they did. Ha Ha ha. It’s very nice to come by, always something interesting happening in the looking Glass. Always a pleasure to read your insights,Undina. You have a very analytical approach to these things. If I may ask, what line of work are you in? I’m not sure if it tells you anything, but I’m in product development for SaaS products. There are perfumes that I wouldn’t mind getting a lifetime supply of before opening the first bottle ;), especially since now I fear reformulations from the day 2 after the release. But I agree with you about decants and will try to “thunk” at least some of them.